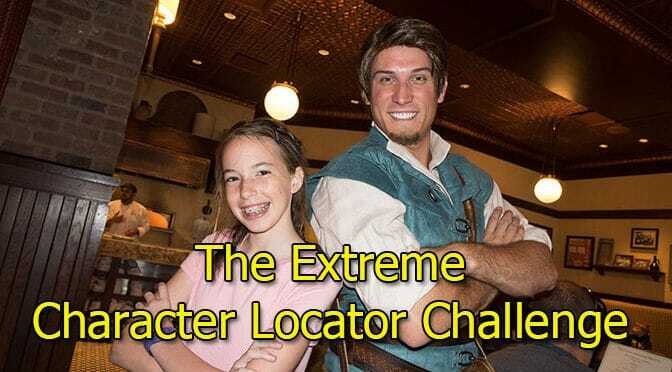 The Character Locator Challenge isn’t for wimps! You’ll walk and stand, walk and stand, walk and stand for an entire day. You must have park hopping priviledges in some form and can either use your own transportation, public transportation or Disney transportation. The goal is to meet as many characters in Disney Parks as possible in a single day by following the rules below. The characters must have appeared in an official Disney / Pixar / Marvel / Star Wars production. Characters such as Streetmosphere, Main Street Citizens, iCan, DiVine or Norway Vikings do not count. You may only count unique characters met. If you meet them in different costumes, it doesn’t add anything to your total. No line jumping or line holding allowed. You must appear in all photos together in the same clothing all day. No change of clothes allowed. At Walt Disney World you must share screenshot of all Fastpass used throughout the day. Screenshot must contain your names. You may include characters met at any character meal during the same day, but must include a photo of your receipt to prove you paid to eat there. This is to eliminate the chance that someone just ran in and took photos with the characters without paying. You must meet Mickey in at least one park. You must meet at least 1 character in each of the 4 Disney World parks (Magic Kingdom, Epcot, Hollywood Studios, Animal Kingdom). At Disneyland Resort, you must meet at least one character in each park. Your attempt must be on a single operating day. Dance parties do not count. Photos must be taken by another person. “Selfies” do not count. Characters appearing in a “Dance Party” environment do not count. Using Character Locator will make this challenge MUCH easier! SIGN UP AT THE BOTTOM OF THE POST! Below I’ll list everyone who meets all of those qualifications here on the Pirate’s Wall of Fame. Are you ready to take on the challenge? *In the past I scored the count based on unique characters and characters in different costumes. Debbie and I met 68 characters with different costumes and 71 total meets. The Lamb family met 73 characters with different costumes! Are you going to take on the challenge? I am preparing to make an attempt. Just need clarification. Will country bears about when they do meets AFTER a dance party I.e during Xmas party I got them roaming before a parade l. They had done a short dance party before. The Gomez family will be postponing our character challenge given the terrible weather forecast for Sunday 1/27. I have a couple questions: do water parks count, do non-disney hotel character meals count, do marathons count, and should the genera rule of thumb be that it only counts if the meet is open to the general public. Hi Kenny, I have a question..I am considering trying the challange on a Tuesday when I attend early morning magic at MK. There are no characters that meet at early morning magic and that that will put me a great position to be first in line for some of the Fantasyland characters when the park opens to all guests at 9AM. Is that allowed under the character challange rules ? Also I will need to open a twitter account and I am not very tech savey, I plan to use photo pass, for the pictures, Is it a simply process to post the photos from MDE photo pass to a twitter account ? Can I do that at the end of the day ? Emm is no problem. Not posting them live to Twitter is a problem. Use a cell phone. Wow – so fun. Since i only get to go every 3-4 years, I probably can’t use one day just for chracters – but for me just seeing characters I have never seen before is a thrill. I managed 47 unique on my recent trip – plus 10 more meets that were in differnt cloths. I saw 11 others unique characters last time I was there & 4 other different ones before that so I am over 60 for my overal total :) That kind of makes me feel good LOL – since I haven’t ever done a speicial event – can you tell that my most recent trip I made major use of Character locator! Me and my cousin are going in January 2017:) he has never been, but i have been 5 times!! I can’t wait to do this! Cool! My daughter and I are doing a 6 day trip in November. We were thinking of hitting all four parks in one day just to say we did it and I think this character challenge is right up our alley. On your character locator, some characters pop up only when you change from ‘name’ to ‘land.’ Also, do you have information on how meet and greets work for Early EMH? Do they just start earlier? I was getting screenshots of what was happening, and realized that I wasn’t signed in and my sub expired. Woops! So do the dance parties count since the characters don’t sign? Old thread, but I love the idea. I won’t meet all the requirements on our trip in June. We’re going to skip EPCOT this time around and no park hopping. That being said, from my previous 5 trips I have met 71 different characters (not including the different Mickey’s, Goofy’s, Donald’s, etc…) and I really only started character hunting on the last 2 trips. Our next trip is 4 full days. I’m going for 29 new characters (where I get my picture taken with them) to get to 100. Based on Fast Passes secured and character meals booked I will have 10 new characters, so its just a matter of coming across 19 others. With the character-poloza and dance parties this is very possible. We haven’t been in 5 years, so there are a lot more “new” regulars that weren’t around 5 years ago. I’ll let you know how I make out. Sounds great. Look forward to hearing about your adventure! Sure, feel free! Please let me know how it turns out. If you want to share your photos and experience afterward, I’d be happy to do that too. Sounds like fun. Look forward to meeting you at WDW sometime to say hi. Hey Kenny! love this idea. All in one day? I am going in Feb and I might have to take you up on this challenge. I am having issues posting a comment to your site, but I will be emailing you in the future for this one! I witnessed you running around for the Ultimate challenge, and I am pretty sure this is more along my pace, and I love it! I see that some comments are needing moderation. I’ll check my settings. Feel free to email me!